Although the 72nd edition of A Guide Book of United States Coins has been out since April, it seems like Whitman is doing a bit of behind the scenes reorganizing for the future. With Ken Bresett taking on the title of Editor Emeritus and Jeff Garrett taking over as Senior Editor, they seem to be a bit behind in some minor, but for some of us, important recognition. 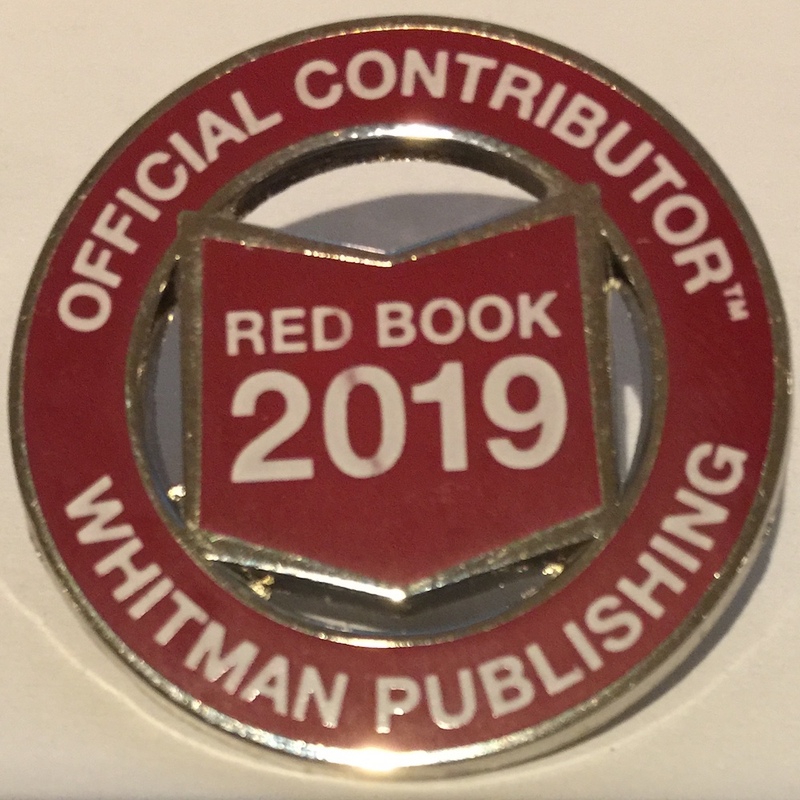  I finally received an Official Contributor’s pin for being a contributor to the Red Book. First, this is my public THANK YOU to Whitman for the pin and allowing me to participate! As I did with last year’s edition, I participated in updating modern coin prices. Modern coins are those classified as being struck after 1964 when silver was removed from most U.S. coins. These are the coins that some dealers do not show a lot of love for because they are not perceived as worth the effort to sell. Although some of that has changed since the State Quarters were first introduced in 1999, the hobby should show more respect to these coins especially since we are 54 years into the modern era. Although many feel that the Red Book’s pricing is obsolete when it comes out, it is still a good guide to understanding the foundation of pricing even if there is are market fluctuations. Thus, it would not hurt to get these prices closer to being correct, especially for new collectors. After all, this is a “guide,” not a price list. This past year was a little different. Aside from not giving us a lot of time to enter prices (more on that later), my new business venture allows me to see the market from a dealer’s perspective. Even though I deal in general collectables and not just coins, I can now view the market from both sides of the counter. Because of time constraints, I concentrated more on proofs and special issues than the business strike versions. One of the reasons why the period for submitting our prices was delayed was that when Jeff Garrett took over as Senior Editor, a source said that he wanted to change a few things about how this was done. No details were provided. I am speculating that the delay in sending out the contributor pins, which also comes with a copy of the Red Book and a Mega Red, is likely because Whitman is working diligently behind the scenes to make it easier for contributors to continue to help while giving Jeff and others a better platform for which to edit the prices. Even though the Red Book is a good resource there are always ways to make it better. I am sure that Jeff will do a great job and hope that I can continue to contribute to the effort.